Organic Chemistry is the study of carbon and the chemical bonds it forms with elements. 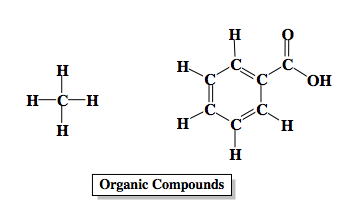 A compound must contain the element carbon in order to be classified as "organic". We say organic chemistry is the study of carbon, so that's important, it’s a study of carbon and the other common nonmetals it's connected to. These other common nonmetals can be hydrogen, can be oxygen, can be nitrogen, can be sulfur, or any of the halogens. There can be examples that don't have one of those nonmetals, maybe phosphorus will get thrown in the mix. But basically an organic compound, the most important part of it is that it has carbon and those carbons are connected to other nonmetals. We're going to say that some organic molecules are made up of just carbons and hydrogens. Of course, because of this, they're simply called hydrocarbons. Here you might think the word hydro means water like to hydrate something, but here hydro just means hydrogens. Remember that. Hydro means hydrogens. Hydration means water. If we take a look at these four different examples, let's try to classify them as being organic compounds and after that, determine if they’re hydrocarbons. If they're not organic compounds, we’ll just simply say they're not organic compounds. For the first one, we're going to say here it has carbons involved so it's definitely organic. So it's an organic compound. Also, it's made up of carbons and hydrogens and that's it, nothing else. It's also going to be classified as a hydrocarbon. This compound here is both an organic compound and a hydrocarbon. For the next one, it also possesses carbons in it and because of that, it is also organic. You're going to have to get accustomed to seeing organic molecules like this. We say that this is called the expanded formula where they basically show all the bonds connected to all the elements. Remember, carbon must make four bonds. These are some of the principles that you guys learned when you first started drawing Lewis dot structures. It's organic but it is not made up of only carbons and hydrogens so it is not a hydrocarbon because it also possesses an oxygen. If we look at C, C is organic because it has a carbon involved. So it's definitely organic, but again it is not a hydrocarbon because it possesses an element different from hydrogen and carbon. Then here if we take a look at the last example, HCl. HCl remember is a strong acid. It possesses no carbon so it's not organic at all. It is an inorganic acid. You'll hear a lot of acids and gem chem being referred to as inorganic acids, that's because they don't possess any carbons. So it's not organic, it’s inorganic because it possesses no carbons. Also, definitely not a hydrocarbon because we don't have any carbons at all. So, it's not a hydrocarbon, it’s not organic. It is inorganic. This is just the beginnings of organic chemistry. Fundamentally, just remember when it comes to organic molecules, the distinguishing factor they all have in common is that they possess a carbon. That carbon makes them an organic compound. If it only has carbons and hydrogens, then it's going to be referred to as a hydrocarbon. Once were able to nail down these principles, then we can move on to more complex ideas dealing with these different types of biological and organic molecules. Determine the molecular formula for the following organic compound. Determine the hybridization for each of the indicated atoms. Each of the indicated bonds is a result of the overlapping of orbitals. What are they? Since carbon is the central element in Organic Chemistry the list of hybridizations is not as extensive as you may be used to having. What is the number of pi bonds for the following compound? Classify each organic compound as a hydrocarbon or a functionalized hydrocarbon. For functionalized hydrocarbons, identify the family to which the compound belongs.